Our cousins from the Veneto were visiting us this past week. Mirna and Marika live in the Northern Italian city of Fossalto di Portogruaro. Once protected by the Venetian Republic, Portogruaro continues to retain the charm of a favored child. The canals, medieval arcades and stone bridges of Portogruaro remind you of a miniature version of Venice. You know you are in the terre dei Doge because the ancient influence of the Venetian empire is still felt in the local gastronomy, wine and architecture of the region. So for their first trip to the United States, I wanted to show them a little bit of Americana which resulted in me learning about the Ugliest Fish in Italy. After an afternoon spent in the Indiana farmland of Shipshewana eating fried chicken, mashed potatoes with gravy and shoofly pie, I wanted to show our Italian cousins another part of America. So after a trip to a cheese factory and shopping for Amish quilts we got back on the road and stopped for dinner at the Islamorada Fish Company. The restaurant would be the perfect place to introduce them to the Margaritaville of the Florida Keys, if not in body at least in soul. There is a 13,000 gallon salt water fish tank in the restaurant bar with an island vibe and a menu that includes regional Floridian specialties including Key Lime Pie and hand breaded wild caught alligator.Nothing like that in Italy! The cousins loved it especially the coda di alligatore; alligator tail. They said it tasted like, you guessed it, . . . chicken. 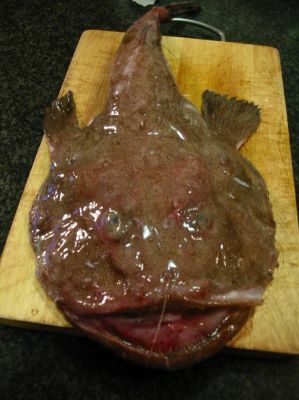 Although Italians don’t eat alligator tails, they do like to eat the tail of what many call, the ugliest fish in Italy, the Rana Pescatrice or Coda di Rospo, also known as anglerfish or monkfish. This translates as Fishing Frog and Toad’s Tail , respectively and because of the extreme unattractiveness of this fish many fishmongers skin them and sell just the tail ends. My Italian cousins tell me that the meat is very good. It is firm, white and mildly sweet and in fact tastes just like . . . alligator. Audrey Niffenegger’s best-selling book, The Time Traveler’s Wife, is about a Chicago librarian named Henry who is cursed with a rare genetic disorder that causes him to travel back into time. He often vanishes at a moments notice as his wife desperately tries to build a stable life together. This dramatic fantasy, of course, does not parallel my life but I often feel like my husband could write a book that describes our travels in Italy based on its premise. The title would be: The Taste Traveler’s Husband with a plot summary that might read something like this; a Northwest Indiana teacher/consultant suffers from a gastronome gene disorder that causes her to be transported to Italy again and again. Over a 10 year period she travels 10,000 miles eating, cooking and shopping in Northern Italy, Tuscany and Umbria with her Italian family and friends as they introduce her to an Italy seldom seen where she discovers the historical and cultural traditions of Italian food and the pleasures of eating al tavola. She travels down Roman roads, past castles and Etruscans ruins, around alpine lakes with mountain vistas, visiting Renaissance chapels and Gothic cathedrals. As time passes it becomes more difficult to leave the Italy of her family and friends and she longs to bring Italy home. So she opens a on-line shop with artisan food products and handcrafted items based on her experiences (www.cosituttimarketplace.com). Deciding to make this fantasy a realty took some doing with a shifting timeline and a journey that was somewhat unexpected. Of course my taste travels through time are on Swiss Air and although I would like them to be more frequent and arbitrary they tend to be confined to twice a year. Another difference between Henry and me is that my husband, Michael, isn’t left behind on these taste travels. He would have none of that.